I decided to read Carrie McNinch's graphic novel I Want Everything to Be Okay after receiving a postcard with the book's cover. I have to admit, the cat angels swayed me a bit, but I was more impressed with the clean lines of the art and the sentiment of the panel (clearing your life from anxiety, experiencing life, not fearing the future, etc.). So much was packed into the cover, I couldn't wait to read the book. 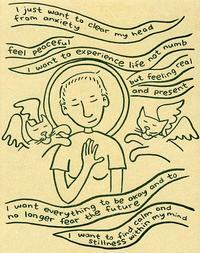 I Want Everything to Be Okay chronicles a year in McNinch's goal to live a sober life. The 98 pages are filled with updates on her life: her interaction with roommates, friends, her cats, and her work. This is no 12-step tract, her life is as imperfect as everyone else's. I Want Everything to Be Okay is this artist's diary, with some days filled with dialog and others a landscape or simple sketch. I am not surprised that McNinch is revered as a founder of the autobiographical comic. Her style is impressive and unflinchingly honest, whether she is discussing her yearning for alcohol or her acupuncture treatment for depression. My next book is Natsuo Kirino's novel, Grotesque.